Pit Boss vs Traeger: Which one is the best for the money? →Pit Boss vs Traeger: Which one is the best for the money? Comparison of Pit Boss vs Traeger pellet smoker is a ball of contention involving two equal antagonists each with its strongholds. We closely associate Traeger with its flavorful BBQ as the most conspicuous feature. But for its Pit Boss counterpart, much we know is all about natural advocacy as far as BBQ applies. If you are among the prospects of smoking, both brands may appear equally promising and to some extent, alluring. Despite the truthfulness in this, there comes a time when you will have to make a resolution. Because not always will you be in position to acquire both smokers. In fact, it doesn’t make sense buying a smoker that doesn’t accomplish your needs and leaving the one with your needs at heart. To help you out, we thought it wise to give you a succinct comparison between Traeger and Pit Boss. After reading through this comparison, trust that no confusion shall again arise regarding these two smokers. Now, let us begin by lightly over viewing the two grills, before delving into the actual comparison. If you want to know Green Mountain Grills vs Traeger Grills, which is the best? Read here. Traeger is a brand associated with great BBQ and very few on the planet can challenge it. Although it is not the best we have ever known, many users acknowledge the greatness in it. It is a company that has manifested utmost commitment to user needs overtime. However, if you were to buy a pellet smoker today, and you purchase this, would you have gone for the best one? Actually, without thoroughly navigating the components of BBQ world, you may not be confident with your decision. To gain this confidence, you need to begin with mastering what Traeger comprises and whether you like it or not. Then you can go ahead and compare with Pit Boss, a brand that we consider closer to Traeger. To read more about Traeger, click here. Pit Boss produces natural pellet smoker(s) with the capability to help you transit smoothly into the world of natural grilling. Pit Boss is a large enough smoker featuring utmost strength in its general construction. Most significantly, we rate this smoker among the digital models with user-convenience and great BBQ results guaranteed. If you take advantage of its natural feature, be sure to enjoy the finest world class food. Because it is easy to use and assures quality in both process and outcomes, it has been advantageous to many. But is it a worth buying equipment? To establish the truth in this, we have set Traeger as a weighing scale to Pit Boss. 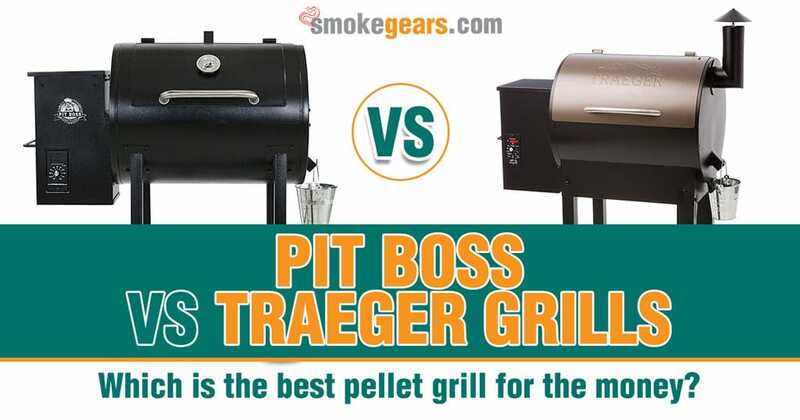 The conflict between Pit Boss and Traeger arises from the very similarity between the two pellet smokers. For this reason, we must closely examine elements that comprise differences and similarities between them. Ultimately, darkness will no longer prevail between the two smokers. In fact, what seems uncertainly now becomes absolute certainty, if only you regard what distinguishes and associates the two smokers. Here, we have based our comparison on salient elements that are of interest to you. These include but not limited to the general design, size, ease of use and functionality, portability and convenience, temperature range, and cost. Of the two wood pellet smokers, Traeger is ahead when we talk of the strength of construction in comparison to Pit Boss. However, we acknowledge that it is not the best. But it is clear that Pit Boss has not worked as hard as Traeger in bringing forth indisputably long-lasting grilling equipment. On the same note, the Traeger is made of non-toxic and clearly coated cast-iron grates. When you grill with Traeger, the process remains uninterrupted from the beginning to the end. Because food does not stick on the firebox of the smoker made of high quality material. Pit Boss is somehow limited on this aspect because of its flimsy look. Though it shares some commonality with Traeger, we should admit that it lags behind. If you were to buy it, you need a substantial investment in cleaning and should be for short term. Price is one of the top-most areas of consideration you will want to take into account when buying pellet smoker. Before you visit either of the two brands for the actual purchase, you obviously need something cost-effective. From our analysis, we have discovered that Pit Boss is always cheaper than Pit Boss, especially when we talk of similar-sized smokers. This is because most of the sizes available at Pit Boss are also available at Traeger. Apparently, the Traeger’s investments are the reasons for a relatively higher price. Nevertheless, the two brands usually overlap. We cannot explicitly state that all the Pit Boss’ smokers are below Traegers’ in price. However, based on the averaging principle, if you are in need of cost efficiency, go for Pit Boss. Warranty is one aspect of measuring quality of the product. A product with longer-term warranty promises better performance. This is because the trust that the brand has placed on it is more than mere word of mouth. By the same token, the warranty placed on Traeger is longer i.e. several years. On the other hand, Pit Boss also comes with a few years warranty. Though not explicit of the fact that Traeger in overall is better than Pit Boss, this can be a good weighing scale. Use of controllers while using your smoker is one of the aspects of optimization and digitization. It is easy to get deceived and imagine that both smokers’ controllers are all the same. But it is important to realize that Pit Boss is a little bit swing when it comes to temperature changing. Identically, when it comes to temperature maintenance, both smokers are barely different. Although there are slight deviations in the manner they maintain temperature, no adverse effect occurs to your BBQ. In the light of this, when you want to find on market a perfect temperature maintaining smoker, we advise Traeger. Check wireless meat thermometer, probe thermometer and smoker thermometer to know more about controlling meat temperature. The difference in the heat management of these two antagonists arises from different locations of the fire pot on both smokers. On the Traeger, you will find the fire pot on its far left side. The cover of Traeger’s fire pot is made of heavy steel heat deflector. Both the heat deflector and the fire pot are covered by solid metal grease tray. However, this isn’t the case when you talk of the Pit Boss. Here, location of the fire pot is in the grill’s central position. Additionally, it lacks a heat deflector covering the fire pot. Instead, what covers the fire pot is a dome-shaped metal shield featuring open slits. When you want to smoke instead of grilling, there is a second metal shield which slides over the open slits. Basically, the difference on this aspect is that the location of the fire pot and the mechanism of heat distribution. While one enables open flame technology, another one is covered and doesn’t. So it depends on your needs which smoker you choose. The temperature range between these two smokers is similar and thus the kind of food you can smoke is just the same. The highest temperature you can set on both smokers is 500 degrees Fahrenheit. On the other side, the lowest temperature you can set for slow smoking is 100 degrees Fahrenheit. In this very regard, both smokers can perform a number of similar tasks in the same way. By the same token, the ease of use of these smokers also equals. Added to this fact, they are both easy to use and user-friendly. Learning to use Traeger is indifferent from learning to use Pit Boss. Therefore, if you have been consistently using one smoker, it won’t present any challenge to you using the other. Everything, right from the process of loading wood pellets to the point of serving food is similar. Although we acknowledge that Traeger is a little bit ahead of Pit Boss, the difference in their sizes is so slight. Even if there existed a larger difference, your needs are apparently guaranteed by both. In other words, both smokers are capable of holding sufficient amounts of food for large groups of consumers. In actual sense, for both Traeger and Pit Boss, you cannot miss a smoker that is above 500 square inches in capacity. At least, when you are looking for a larger smoker to substitute your old one, here we don’t have a verdict. You might have to consider other factors discussed in the section of differences. Just as the entire cooking capacity is large and convenient in both Traeger and Pit Boss, so is the hopper capacity. Ideally, Hopper capacity should correlate to the cooking capacity because of the smoke: food ratio. The more food you smoke the more the smoke you will require. However, by the virtue of the hopper capacity being large does not necessarily imply great smoking results. You have to commit filling the hopper with your best wood pellets to acquire the ultimate food taste and flavor you desire. Concurrently, the amount of wood pellets you feed into the hopper directly determines the length of continuous cooking time. To avoid interruptions in the course of cooking, better fill the hopper to its fullest and enjoy convenience throughout the smoking process. To make this easier, you can use the manual that come with your smoker on delivery. One clear fact is that both of the smokers come with efficient digital controllers. This is what makes temperature maintenance and adjustment easier. Despite the above discussed difference on the accuracy of the controllers, they are both designed for the same purpose. And they both serve the purpose for which they are intended, though at different levels of accuracy. Who are the most probable beneficiaries of Traeger and Pit Boss? What we have given above is an organic analysis of the differences and similarities of the two pellet smoker brands. However, to make it palatable and a complete guide for you, we have to be specific. The best way to be specific is to determine a pellet smoker that suits you most. Considering your needs, it is better you be specific on a better alternative. To help you choose more effectively, we have classified different users best suited for either of the two grills. What matters here is the extent to which you really need a particular aspect in a grill and also your financial position. Let’s get down to specific parties who would enjoy using either of the smokers. Traeger as we know it and have analyzed its features is conspicuously associated with large size, great flavor and strength of construction. But insistently, it is not the best of all. If you are up for a smoker that substantially fulfills the need for large amounts of food, choose this one. For more information about the potential users of Traeger, click here. Pit Boss is a cheaper alternative to Traeger, although both smokers have the potential to deliver similar BBQ results. One reason for which Pit Boss is widely praised is the natural smoking element of it. So if you are a lover of naturally smoked food, you are a suitable user of this smoker. Additionally, people with large families and to some extent institutions like hospitals and restaurants can find satisfaction here. Although you might have to cook more than once in a bigger institution, it is worth buying. We cannot compare it to many others known to us. To find out further whether you can benefit from Pit Boss pellet smoker, click here. With the above succinct analysis of the top brands availing great smokers, you are apparently a decided buyer. And now you know Pit Boss vs Traeger - Which is the best pellet grill for the money. Because the differences are slight and Traeger holds more of the strengths than weaknesses it has an upper hand. In this particular review we have to admit that Traeger is a relatively superior brand. Traeger takes the lead in terms of size, warranty and temperature management. Pit Boss is cost effective, though not that cheap. Although the difference is not that big, at least a winner must emerge. For us in this updated review, Traeger is better than Pit Boss.